Happy New Year! Here’s to a year more just and kind than the last. May the fight against systemic injustice grow stronger, and may those who try to uphold those systems change their minds and their ways. How about you? Any non-resolutions this year? 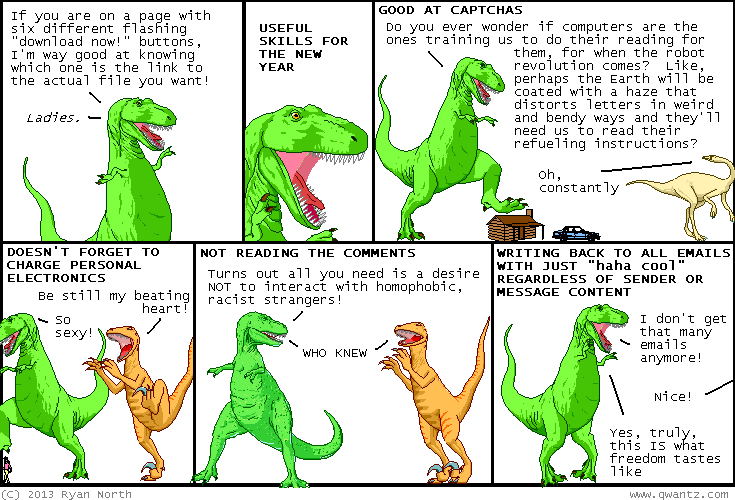 Comic from the ever-wonderful Dinosaur Comics by Ryan North. This entry was posted in Funtimes, Human Rights and tagged a better world, dinosaur comics, Happy New Year, human rights, justice, New Year celebrations, New Year resolutions, social justice by lisafindley. Bookmark the permalink. Celebrations instead of resolutions, I like that! I do admire your ability to find the positive in most situations, Jeannie, while never letting up on improving the world. That’s a valuable balance.